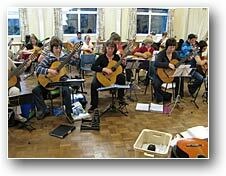 April 23rd 2009 saw the 21st birthday meeting of the Guitar Workshop, which was born on 20th April 1988. You can read about the 4 venues we've met at this page, starting at a player's house and moving to a comfortable venue with easy access to the major roads in the area. Over the years we've met as many as 21 times in a year, and as few as 15. 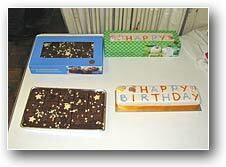 But if we average it out, then our birthday Workshop was the 377th meeting! There are 152 pieces in the Workshop Collection. 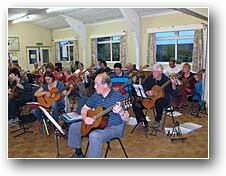 Over the years we've played 301 arrangements, some superseded by "Mark 2" arrangements, and some moved to a pack of music called "Workshop Plus" for players who meet at home and want even more music. There are a further 38 pieces in the Carol Collection, and over the years we've played 55 Christmas arrangements. Add that lot up, and it's pretty much an average of one new piece every single Workshop! We had our first concert in 1989. 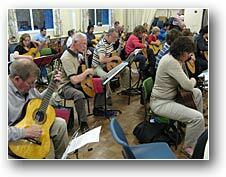 They were originally once a year at Christmas, with a fund-raising event outdoors in the summer, but in 1998, when Workshop was ten years old, we held an April concert and from that point on we've run two concerts a year, so that friends and families can hear both Christmas music and Workshop pieces. Over the years we've raised £25,014.95 for good causes locally! At the 21st birthday, there were cakes and a celebratory drinks, and our annual rendition of Happy Birthday, arranged in the style of The Blues.